1. Acceptance: How can you love and respect others if you can’t do the same for yourself? Every day, we face ourselves in the mirror until we can’t help but love the person we see looking back. This self-acceptance impacts every interaction you have in the world. 2. Healing: You are the Captain of your own health. We have carefully curated the most effective Yoga and Pilates methods and mindfulness practices available so that our students can heal and recover from any obstacle life throws at them: physically, mentally, and emotionally. 3. Growth: We believe in continued growth, transformation, and change. Our teachers are dedicated to continuous professional development so our students can truly thrive. 4. Community: Bringing people together is what we do best. Our thriving community is the most supportive group of caring individuals you’ll ever meet. We support our greater community through volunteerism and collaboration to make the Seacoast a better place to live. 5. Green: We are committed to reducing our impact on the environment in all aspects of the business from green cleaning products and energy-efficient appliances to the most sustainably-sourced and local retail partnerships. By improving the way we do business in the world, we have the power to change our future. 6. Integrity: The strength of our community is built upon trust and that trust comes from the unfailing fairness and integrity of our staff and leadership. We hold ourselves, our teachers, and our community to high moral and ethical standards. 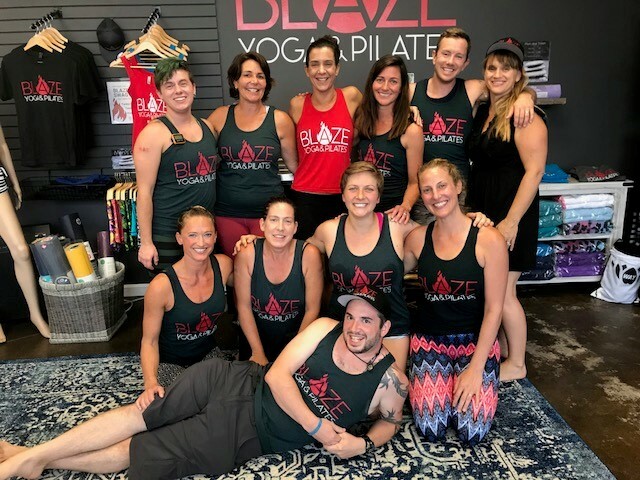 Blaze will always be a safe place to practice and to heal. 8. Courtesy: We practice civility and courtesy in all of our interactions with others to show our respect for every member of our community: changing the world one act of courtesy at a time.